Copyright © 2017-19 Carpe Astra Ltd.
All the concepts we have assembled here, have already been proven individually and are based upon known, well established scientific principles. Here is a reminder of the basic concepts of how the system works. The launch vehicles will work by displacing L.T.A.C.G. (Lighter Than Air Combustible Gas) — ideally hydrogen and/or methane — from a fuel cell; lifting body fuel tank, which will be a large rigid or semi rigid structure, composing the greater part of the launch vehicles. The fuel cell will be large enough to be able to lift the launch vehicle and its contents passively into the atmosphere. Vehicle contents can include payload and the ballast coolant fuels, which along with the L.T.A.C.G, will have enough energy to not only be able to lift the launch vehicles to the edge of the upper atmosphere; but also to be able to actively lift and accelerate the launch vehicles, by feeding the L.T.A.C.G., for combustion into the engine — along with the ballast coolant fuels. These fuels could include HTP (High–test peroxide), which is an environmentally friendly, more energy dense fuel than the L.T.A.C.G.. Although other far more energy dense fuels could be used, these would not be as environmentally friendly as HTP. The engine system used will be a hybrid air–breathing system that will greatly increase energy efficiency. The problems of getting into space and our solutions. The fuel problem in traditional rocketry as described in this video until 1:11, can be greatly solved by using Cape Astra’s fully hybrid Rockoon technology. Q. How does a fully hybrid Rockoon technology solve the fuel problem? A. Whilst in the atmosphere you can use Archimedes displacement principle to fully and/or partiality negate Earth’s gravity in the Isp variant of the rocketry equation. This multiples the efficiency of any fuel, on Earth launched Rockoons, by 9.81 times — whilst it is buoyant. If using atmospheric oxygen to burn carried hydrogen, this can easily be multiplied by a further 9 times giving an 88.29 times potentially efficiency gain. However the maximum potentially achievable efficiency gain is larger, due to other factors and variables – dependent upon level of buoyancy, more extensively describe in our patent. Q. Is a fully Hybrid Rockoon system, technologically feasible using today’s technology? A. Yes! all the component parts needed have already been separately tested and proven to work in real world applications. It is just that nobody has put them together until Carpe Astra’s patent application — that we are aware of. Q. Does Archimedes displacement principle effectively negate gravity locally for any given vehicle using it? A. Yes. This can easily be illustrated by comparing the effort required to pull a lorry along a road, to that of pulling a similarly sized boat through the water. The latter takes much less effort as Archimedes displacement principle works as a force multiplier in this instance. This principle also works with gases as well as liquids. Q. Can inflatables be strong enough? A1. NASA has successfully tested an inflatable heat shield at least Mach 5; using an inflatable to decelerate a vehicle quickly, descending from thin to thick parts of atmosphere. It should be much easier rising from thick to thin using an aerodynamic shape accelerating at a chosen rate in the atmosphere. A2. Saul Griffith on inflatable robots, the advantages of inflatables that are shown also apply to Rockoons. Q. Can a balloon go hypersonic? A. It has previously been done in the high upper atmosphere. The world’s first communications satellite was also the world’s first inflatable satellite; a silvery plastic Mylar balloon 100 feet (30 meters) wide called Echo 1A. The first transmissions were received on August 12, 1960 and Echo 1A re–entered Earth's atmosphere on May 24, 1968. Proof of concepts that make getting into space safer, cheaper, cleaner and on an industrial scale. Hydrogen Zeppelins lifted huge amounts of weights and carried them long distances –utilising the materials and technologies that were available just over a century ago. With the improvements in modern materials and their uses; it is our understanding and belief, that a hybridisation of airship/blimp technologies with modern rocket technologies. We should substantially improve the efficiencies and abilities of space launch vehicles; as well as significantly lowering the costs of launching mass into space. Particularly in our case, as we are innovatively starting with our primary fuels in its gaseous state and also air breathing for tens of kilometres. This should also prove that an initially lighter than air launch vehicle could be used to exploit and industrialise space. A set of proofs are listed below, with a brief explanation to show that modern materials and technologies are at the stage where this is now viable. Modern inflatables have been shown to be able to support great weights. For example, there is video showing an inflatable elephant carrying two adults and two children. Watch the video showing how Saul Griffith solve for x presentation working on the maths for strong inflatables. This means that structural inflatables can be used for soft machine–like vehicles as both load bearing and as active soft machine parts. The supersonic ping pong ball shows that lightweight materials can survive supersonic acceleration and can even penetrate more dense materials. Therefore, travelling through a reducing density of atmosphere should be achievable for the entire launch vehicle system. More importantly, this shows that gases can be accelerated easily and quickly to supersonic speeds — due to their low inertia, just by the use of pressure differentials through correctly configured hour glass shapes in the pipework. This can be used to accelerate lighter than air gases from the fuel tank to the combustion chamber at supersonic velocities. This can then be ignited, expelled and accelerated out of the exhaust at increased supersonic velocities, due to the combustion of the supersonic gases and the shape of the exhaust nozzle. Thrust is also obtained just from the pressure differential of the escaping gases expelled out of the engine without ignition, just like a party balloon used as a rocket balloon. Watch Royal Institution’s Balloon Car Racers about rocket balloons. The British Black Arrow and Prospero satellite launch proved in 1971 that HTP (H2O2) in conjunction with refined kerosene (RP–1 paraffin) can successfully launch satellites into orbit. This was achieved at a far cheaper cost per flight than any of its contemporaries at the time. 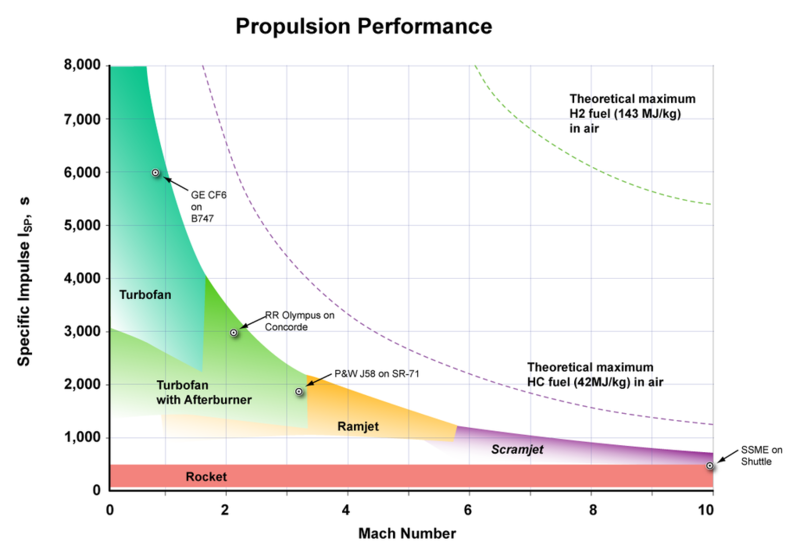 H2O2 mono–propellant produces a maximum specific impulse (ISP) of 161 seconds (1.6 kNs/kg), this can be scaled up so that the Isp is 1610 seconds, by the use of the system whilst lighter than air; which changes it from a low–performance mono–propellant to a high–performance one. Peroxide in normal use generates much less thrust than hydrazine but is non toxic. As a bi–propellant H2O2 is decomposed to burn a fuel as an oxidiser. Specific impulses as high as 350 seconds 3.5 kNs/kg) can be achieved; this again can be scaled up to an Isp of 3519 seconds at 1 atmospheric pressure using the system whilst lighter than air. Peroxide used as an oxidiser gives a somewhat lower Isp than liquid oxygen, but is dense, storable, non–cryogenic and can be more easily used to drive gas turbines to give high pressures using an efficient closed cycle. It can also be used for regenerative cooling of rocket engines. The Dyson bladeless fan uses the Coanda effect by increasing the efficiency of air flow. This can be explained by using a smaller amount of high–pressure air flow to lever a larger amount of lower pressure air flow. In effect a smaller force levers a larger mass of air flow for a smoother greater air flow of a ratio of about 15:1. For the launch vehicles, the high-pressure lever comes from the combustion of fuels within the engine, which is then used to lever the atmospheric air which surrounds the vehicle and engine. This then reduces atmospheric drag and also uses the atmospheric air as a reaction mass. This proves that the technology works, and that it should be possible to scale it up; as lamina air flow technology, which has been used by the aviation industry successfully for more than seventy years, in aircraft design and construction. Hydrogen and helium gas zeppelins could and can passively lift huge amounts of weight. For example the Hindenburg had a lift capacity of 87 metric tons and the USS Macon, the flying aircraft carrier, had a lift capacity of close to 200 metric tons. They were also relatively safe compared to the contemporary, heavier than air, craft at the time; as an example, the Hindenburg disaster where two thirds of the people survived compared to most heavier–than–air craft where 100% fatalities tended to occur when falling out the sky. The Hindenburg explosion also shows that the large amount of potential chemical energy available within the airship — by its combustion — which shows that the energy would be available for use in active flight, as well as for use in passive lift. 3D printing has come a long way in recent years and you can now print working rocket engines which have been produced in specialist steels. Though it should be possible to print in alumina (amorphous artificial sapphire) for its better chemical and heat resistance properties, although other materials could also be used. The European cost targets for hydrogen generation were EUR9.90/kg (£7.92/kg*) in 2015 and EUR5.50/kg (£4.40/kg*) in 2025 (McKinsey: A portfolio of power–trains for Europe: a fact–based analysis). The refuelling equipment is quoted separately and is typically tailored to the user’s specific requirements. The costs associated with shipping the unit to site are not included as they are location specific.
) Aerogels and their 3D printed nano-structure descendants have improved over the last decade and could be used in various parts of the vehicles and engines, reducing weight. g0 is the acceleration at the Earth's surface (in ft/s2 or m/s2). Whilst a launch vehicle is displacing more than its weight in air, then g0 can be cancelled in the above equation giving the new equation Isp = Ve + The amount of extra lift in m/s. This then will be defined as Isp1. Whilst a launch vehicle is displacing exactly its own weight in air, then g0 can be cancelled in the above equation giving the new equation Isp = Ve. This then will be defined as Isp2. and Gml is the gross mass of launch vehicle as a particular second in time. Note: Isp1 and Isp3 will vary on a per second basis, due to lift from displacement being a variable at any given second. So the overall Isp is a simplified equation, and the traditional proportion of Isp will have minor changes due to g0 changing slightly with changes in height until first orbital height has been reached. The above proof shows that the theoretical maximum Isp of burning H2 in air when the launch vehicle is displacing its own weight in air should be approximately 80,000 seconds at around Mach 5 and under the same conditions Waste heat dumped into H2O gives an approximate Isp of 1,900 seconds. H202 by itself gives an approximate Isp of 1,610 seconds at 1 atmospheric pressure + when used with H2 gives an approximate Isp of 3,519 seconds at 1 atmospheric pressure. Isp can be increased the H2 + O2 reaction, also the HTP by itself and the HTP + O2 with decreasing atmospheric pressure; provided the vehicle along with its fuel is still displacing its own weight or more in atmosphere. These ten points that have already been proven in existing systems, plus the eleventh written proof; show that it is feasible to bring down the price of getting mass into space by at least one or two scales of magnitude — possibly three or four scales of magnitude with some reiterative refinements using the best possible materials technology. It demonstrates that not only is the industrialisation and exploitation of the solar system viable. Additionally that it is relatively safe and inexpensive as well as a commercial benefit, and a viable survival strategy for the human race. If traditional rockets are equivalent of first-generation steam engines; though they got the job done, there were often catastrophic explosions and they were not very efficient. Whereas we see the System as the equivalent of the hybridisation of the internal combustion engine and the electric engine all in one stage. With the analogy that the invention of the internal combustion engine led to many different kinds of vehicles which lead to globalisation and more advanced technologies and social systems. The System, we believe, could provide a phase change in a similar but more expansive manner. Hydrogen gas, whilst in atmosphere, can lift itself passively. Hydrogen gas can react (burn) with atmospheric oxygen to produce active thrust without the energy losses incurred when heating from its liquid state. The by-product of hydrogen gas reacting with atmospheric oxygen is H2O, in the form of steam, which is an environmentally safe compound, without any regulatory problems. By pressurising hydrogen gas above STP the energy density can be increased, and the additional mass can be used as a cache ballast, for the optimisation of the flight profiles. Gasses are easier to mix than liquids or solids, which gives the flexibility to turn the engine on and off at will. Hydrogen is the most abundant element in the universe and we believe its costs can eventually be dramatically reduced. By using technology, to cost effectively put space–based satellite power stations in orbit, to broadcast cheap and clean energy that will enable the production of economic ground–based hydrogen. This medium to long term view of a hydrogen economy, could lead to a more stable medium to long term, prosperous and environmentally friendly economy on a global scale. Methane gas, whilst in atmosphere, can lift itself passively. Methane gas can react (burn) with atmospheric oxygen to produce active thrust without the energy losses incurred when heating from its liquid state. By pressurising methane gas above STP the energy density can be increased, and the additional mass can be used as a cache ballast, for the optimisation of the flight profiles. Methane is a by–product that is regularly used as an energy resource throughout the world; it is a relatively cheap source of energy. It burns at a lower temperature than hydrogen and is more energy dense, however methane has a lot less passive lift capability. As helium is lighter than air it can be used to lift the vehicle safely and inertly, in conjunction with the passive lift from the gaseous hydrogen fuel. The thermal transfer properties of helium prevent the overheating and degradation of the outer skin of the vehicle due to friction. The thermal transfer properties of helium can be used to safely heat up the hydrogen gaseous fuel in the vehicle, which increase the energy efficiency of the gaseous hydrogen fuel combustion reaction at the point of ignition in the engine. As helium is non-combustible it can be used to protect and store hydrogen gas so that it does not combust in its storage phase. Helium, used as an inflatable support structure, will keep the structural weight of the vehicle down — so that more energy can be used more effectively in lifting the vehicle. Helium gas will expand as the vehicle ascends so that the structural integrity of the vehicle increases. This is used to prevent any concertina effect due to the high G acceleration expected. Water is easily manipulated, is a safe stable ballast and has been successfully used in airships and balloons for over a hundred years. Water is very stable with its very high specific heat capacity, which means only small amounts of water are required for use as a coolant, as opposed to traditional rocket fuels. Water is very abundant, cheap and easily available. Water can be used to produce thrust in the form of super–heated steam, created by recycling the wasted heat energy of the combustion of the various fuels used within the engine. Once in space water can be used in conjunction with microwaves, to produce a source of thrust to journey around the solar system. It is stable at ambient temperature so that it does not have the cost and weight penalties of the cryogenic equipment used in traditional rocketry. Hydrogen peroxide has been used in conjunction with another fuel to successfully put Prospero into orbit, which was Britain’s only self–launched satellite, with costs which were significantly less than the American launches of the comparable era. Hydrogen peroxide breaks down into environmentally friendly products of water in the form of superheated steam; oxygen when used as a mono–propellant and, when burnt with gaseous hydrogen, also produces environmentally friendly superheated steam. Hydrogen peroxide at ambient temperatures can be stored safely in a plastic container and is an easily manipulated liquid. The advantages of the system as a keystone technology is that it would help enable all these other technologies and industries. The well established known principles and laws of physics that we have based our concepts on are. Archimedes’ displacement principle states that the upward buoyant force that is exerted on a body immersed in a fluid, whether fully or partially submerged, is equal to the weight of the fluid that the body displaces and acts in the upward direction at the centre of mass of the displaced fluid. Archimedes' principle is a law of physics fundamental to fluid mechanics. It was formulated by Archimedes of Syracuse, remembering this law is true for gases as well as liquids. In other words, for an object floating on a liquid surface (like a boat) or floating submerged in a fluid (like a submarine in water or dirigible in air) the weight of the displaced liquid equals the weight of the object. Thus, only in the special case of floating does the buoyant force acting on an object equal the objects weight. Consider a 1–ton block of solid iron. As iron is nearly eight times as dense as water, it displaces only 1/8 ton of water when submerged, which is not enough to keep it afloat. Suppose the same iron block is reshaped into a bowl. It still weighs 1 ton, but when it is put in water, it displaces a greater volume of water than when it was a block. The deeper the iron bowl is immersed, the more water it displaces, and the greater the buoyant force acting on it. When the buoyant force equals 1 ton, it will sink no farther. When any boat displaces a weight of water equal to its own weight, it floats. This is often called the principle of flotation: A floating object displaces a weight of fluid equal to its own weight. Every ship, submarine, and dirigible must be designed to displace a weight of fluid at least equal to its own weight. A 10,000–ton ship’s hull must be built wide enough, long enough and deep enough to displace 10,000 tons of water and still have some hull above the water to prevent it from sinking. It needs extra hull to fight waves that would otherwise fill it and, by increasing its mass, cause it to submerge. The same is true for vessels in air: a dirigible that weighs 100 tons needs to displace 100 tons of air. If it displaces more, it rises; if it displaces less, it falls. If the dirigible displaces exactly its weight, it hovers at a constant altitude. While they are related to it, the principle of flotation and the concept that a submerged object displaces a volume of fluid equal to its own volume are not Archimedes’ principle. Archimedes’ principle, as stated above, equates the buoyant force to the weight of the fluid displaced. One common point of confusion regarding Archimedes' principle is the meaning of displaced volume. Common demonstrations involve measuring the rise in water level when an object floats on the surface in order to calculate the displaced water. This measurement approach fails with a buoyant submerged object because the rise in the water level is directly related to the volume of the object and not the mass (except if the effective density of the object equals exactly the fluid density). First law: In an inertial frame of reference, an object either remains at rest or continues to move at a constant velocity, unless acted upon by a force. The gas laws were developed at the end of the 18th century, when scientists began to realize that relationships between pressure, volume and temperature of a sample of gas could be obtained which would hold to approximation for all gases. Gases behave in a similar way over a wide variety of conditions because they all have molecules which are widely spaced, and the equation of state for an ideal gas is derived from kinetic theory. The earlier gas laws are now considered as special cases of the ideal gas equation, with one or more variables held constant. The absolute pressure exerted by a given mass of an ideal gas is inversely proportional to the volume it occupies if the temperature and amount of gas remain unchanged within a closed system. or, Pressure multiplied by volume equals some constant k.
where P is the pressure of the gas, V is the volume of the gas, and k is a constant. The equation states that the product of pressure and volume is a constant for a given mass of confined gas, which holds as long as the temperature is constant. For comparing the same substance under two different sets of conditions, the law can be usefully expressed as P1V1=P2V2. The equation shows that, as volume increases, the pressure of the gas decreases in proportion. Similarly, as volume decreases, the pressure of the gas increases. The law was named after chemist and physicist Robert Boyle, who published the original law in 1662. When the pressure on a sample of a dry gas is held constant, the Kelvin temperature and the volume will be directly related. 1 kg takes up 11.12 cubic metres at STP. So, a 1 kg mass of Hydrogen can lift 13.37 kg of mass passively. 1 kg produces 143 mega-joules when burned in oxygen. 1 kg produces 55 mega-joules when burned with oxygen. High–Test Peroxide or HTP is a highly concentrated (85 to 98 percent) solution of hydrogen peroxide, with the remainder predominantly made up of water. In contact with a catalyst, it decomposes into a high-temperature mixture of steam and oxygen, with no remaining liquid water. It can be used as both a mono–propellant and a bi–propellant. Normal propellant-grade concentrations, therefore, vary from 70 to 98%, with common grades of 70, 85, 90, and 98%. Graphene has a theoretical specific surface area (SSA) of 2630 m2/g. This is much larger than that reported to date for carbon black (typically smaller than 900 m2/g) or for carbon nanotubes (CNTs), from ≈100 to 1000 m2/g and is similar to activated carbon. Engineering companies for possible construction of vehicle prototypes.